Teacher evaluation has become a key policy issue. Comprehensive programmes have been developed in the US which include assessment criteria and quality indicators and may also be linked to teacher tenure, recertification or pay. In the UK and NI less elaborate systems centre around monitoring classroom practice, appraisal and review using quality assurance frameworks or professional standards. The issue of the failing teacher highlights the complex process of improving practice. 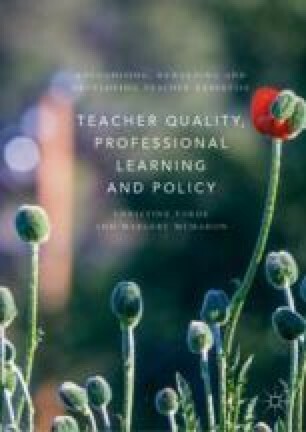 Defining effective practice and providing feedback that enables teachers to enhance their practice are crucial elements in the development of meaningful and reliable processes of teacher evaluation. Accomplished Californian Teachers. (2010). A Quality Teacher in Every Classroom: Creating a Teacher Evaluation System That Works for California. Stanford, CA: National Board Resource Centre. https://accomplishedcaliforniateachers.files.wordpress.com/2010/05/act-a-quality-teacher-in-every-classroom.pdf. Asia Society. (2013). Improving Teacher Quality Around the World: The International Summit on the Teaching Profession: The 2013 International Summit on the Teaching Profession. New York: Asia Society. https://asiasociety.org/files/teachingsummit2013.pdf. Asia Society. (2018). New Challenges and Opportunities Facing the Teaching Profession in Public Education: The 2018 International Summit on the Teaching Profession. New York: Asia Society. https://asiasociety.org/sites/default/files/inline-files/2018-international-summit-on-the-teaching-profession-edu-istp.pdf. Australian Institute for Teaching and School Leadership. (2011). Australian Professional Standards for Teaching. Melbourne and Canberra: AITSL. https://www.aitsl.edu.au/. Chassin, Y. (2016). Enhance the Standing of the Teaching Profession by Firing Incompetent Teachers. Montreal: Montreal Economic Institute. http://www.iedm.org/files/note0116_en.pdf. Coggshall, J. G., Rasmussen, C., Colton, A., Milton, J., & Jacques, C. (2012). Generating Teaching Effectiveness: The Role of Job-Embedded Professional Learning in Teacher Evaluation (Research and Policy Brief). Washington, DC: National Comprehensive Center for Teacher Quality. http://www.gtlcenter.org/sites/default/files/doc/GeneratingTeachingEffectiveness. Darling-Hammond, L., Jaquith, A., & Hamilton, M. (2012). Creating a Comprehensive System for Evaluating and Supporting Effective Teaching. Stanford, CA: Stanford Center for Opportunity Policy in Education. http://www.smmcta.com/uploads/9/9/4/2/9942134/evaluation_research_stanford_2012.pdf. Donaldson, G. (2011). Teaching Scotland’s Future: Report of a Review of Teacher Education in Scotland. Edinburgh: Scottish Government. http://www.gov.scot/Resource/Doc/337626/0110852.pdf. European Union. (2007, December 12). Notices from European Union Institutions and Bodies. Council, Official Journal of the European Union, C300/07:1, https://eur-lex.europa.eu/legal-content/EN/TXT/PDF/?uri=CELEX:42007X1212(01)&from=EN. Ingvarson, L., & Kleinhenz, E. (2006). Standards for Advanced Teaching: A Review of National and International Developments. Melbourne, VIC: ACER. http://research.acer.edu.au/teaching_standards/2. Ingvarson, L., & Rowe, K. (2007, February 5). Conceptualising and Evaluating Teacher Quality: Substantive and Methodological Issues. Conference Paper presented at the Economics of Teacher Quality Conference, Australian National University. http://research.acer.edu.au/learning_processes/8. National Board for Professional Teaching Standards (NBPTS). (2016). What Teachers Know and Should Be Able to Do (2nd ed.). Arlington, VA: National Board for Teaching Standards. http://accomplishedteacher.org/wp-content/uploads/2016/12/NBPTS-What-Teachers-Should-Know-and-Be-Able-to-Do-.pdf. National Board for Professional Teaching Standards. (2018). National Board Certification Overview. Arlington, VA: National Board for Teaching Standards. http://www.nbpts.org/national-board-certification/overview/. OECD. (2005). Teachers Matter: Attracting, Developing and Retaining Effective Teachers. Paris: OECD. http://www.oecd.org/edu/teacherpolicy. OECD. (2009). Creating Effective Teaching and Learning Environments: First Results from TALIS. Paris: OECD. https://www.oecd.org/education/school/43023606.pdf. OECD. (2013). TALIS 2013 Results: An International Perspective on Teaching and Learning. Paris: OECD. http://dx.doi.org/10.1787/9789264196261-en. OECD. (2016). Teaching and Learning International Survey: TALIS 2018 Survey Brochure. Paris: OECD. http://www.oecd.org/education/school/TALIS_2018_brochure_ENG.pdf. Ontario College of Teachers. (2006). Standards of Practice for the Teaching Profession (Rev. ed.). Toronto, ON: Ontario College of Teachers. https://www.oct.ca/public/professional-standards/standards-of-practice. UNESCO Institute for Statistics. (2006). Teachers and Educational Quality: Monitoring Global Needs for 2015. Montreal, QC: UNESCO-UIS. http://uis.unesco.org/sites/default/files/documents/teachers-and-educational-quality-monitoring-global-needs-for-2015-en_0.pdf. Wragg, E. C., Haynes, G. S., Wragg, C. M., & Chamberlin, R. P. (1999, September 2–5). Managing Incompetent Teachers. Conference Paper for the British Educational Research Association Annual Conference, University of Sussex at Brighton. http://www.leeds.ac.uk/educol/documents/00001253.htm.